What has Baking and public speaking got in common? Well it’s great to have something tasty at the break and Susan provided some lovely, homemade treats. Anyone is welcome to bring some tasty treats to any meeting and we’ll make sure they get eaten! Apart from the food, we had a great meeting with plenty on buzz. Euan lead us expertly – we can all take lessons from his clear explanations and smooth way he got us through the meeting. We were in for another treat from Juan Carlos who took us back to our childhoods with his stories of his bike in the town he grew up in. Another expert example of how to deliver a speech with humour, gestures and props. Claire did a superb job of evaluating it – easy to find things to commend but a challenge to find improvement possibilities. Our taste buds were teased with the foody themed Table Topics – it was great to see how everyone had their own particular “must haves” and just how different we all are. Well done to Sheila for completing her Advanced Communicator Bronze Award. Thanks to everyone who took part – we had really inspiring evaluations. Feedback is so important, it is one of the ways we learn. Stuart picked out some of the lovely words and phrases we used. We got quick recaps in Susan’s timer report. The start was Jonny, first time at the Ah Counter who brought us the “button of doom”. Jim’s evaluation of Table Topics was carried out with his usual good humour. 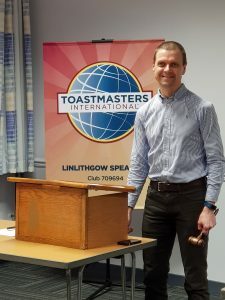 DON’T FORGET – the speech contest on 27 March; To tick the Agenda; our next meeting is on 27 February. And don’t forget to help us do baking and public speaking again by brining some tasty treats!